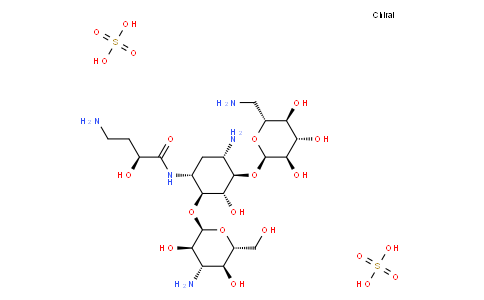 Amikacin sulfate(BAY416651 sulfate) is a semi-synthetic aminoglycoside antibiotic derived from kanamycin A.
Amikacin disrupts bacterial protein synthesis by binding to the 30S ribosome of susceptible organisms. Binding interferes with mRNA binding and tRNA acceptor sites leading to the production of non-functional or toxic peptides. Other mechanisms not fully understood may confer the bactericidal effects of amikacin. Amikacin is also nephrotoxic and ototoxic. Amikacin is useful against gentamicin-resistant gram-negative bacilli and also in the treatment of infections caused by susceptible Nocardia and nontuberculous mycobacteria.